Well its literally been just an amazing week in paradise aka Tianmu. Like its sooo beautiful here. Last Monday this investigator family, the Liang family,drove us to the east coast and took us to 2 historical spots, 九份 (Jiufen) and 金瓜石 (Jinguashi). Both have so much history and are just soooo beautiful. I loved it. But the best part was we got to spend all day with this super cool investigator family. But anyways another little highlight from this week was General Conference. SO MUCH FOCUS ON THE SPIRIT. I loved it. Anyways I'm loving the mission. Loving the mission. Loving the people. And most importantly loving Jesus. Well 天母 is a pretty great place. Elder Triplett and I are already seeing so many miracles here. My first night here we had the opportunity to meet with this guy named Kirby that came to English class and had interest in learning more about us missionaries teach. So we taught him the Restoration and he was super interesting in Joseph Smith and the Book of Mormon. 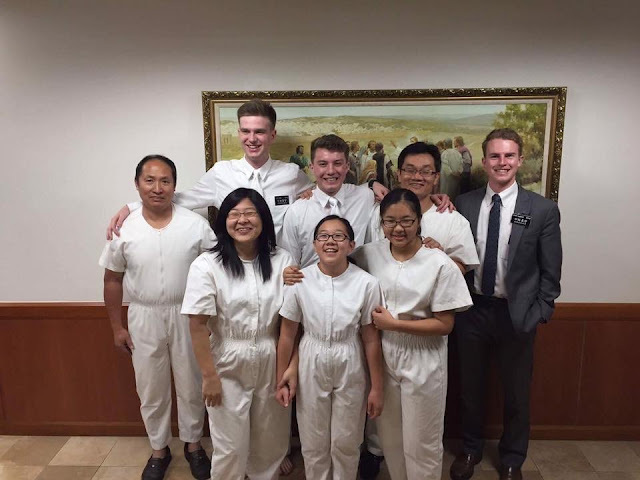 We invited him to come to a YSA fireside at the Jinhua Chapel and he came! He loved it and just didn't stop asking questions about the church the whole time. We then met with him again after English class and he set a baptismal date! He's just a super great guy and actually just becoming a great friend to me and Elder Triplett. Well this was just the best week of my life. Last Wednesday we had a zone conference and Elder Funk came and blessed us with some great insights into how to be better missionaries. He really just once again stressed the importance of member work, which we all know is just absolutely essential. So this week was just the best week ever. THE LIAO FAMILY GOT BAPTIZED! It was so amazing. Their testimonies are all so strong. When Nick was asked to bear his testimony in sacrament, it was so powerful. He started it by saying he had been reading in 2 Nephi 31 and started talking about the importance of enduring to the end. 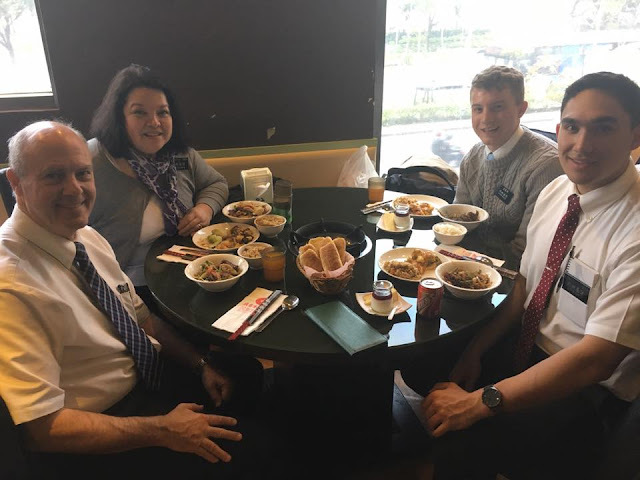 After sacrament, we had a potluck and the former Provo mission president happened to be there visiting with his daughter who served in Taipei. He had some good conversations with Nick about the temple and Nick expressed a lot of desire to take his family there. They're just the best family ever and are going to be such a great help in building up God's kingdom here in Taiwan. I continue to be amazed at how the Holy Ghost inspires people! 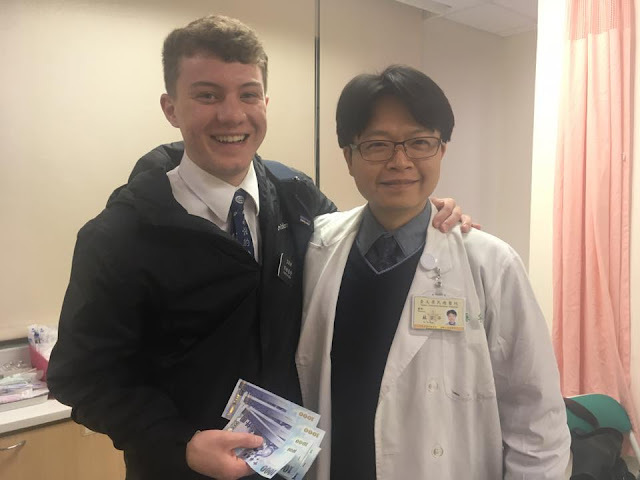 Today we went for a follow up appointment for this missionary with a hurt ankle. Imaging study showed he needed a cast for 3-4 weeks, but can't walk or bike with a cast and it rains frequently. I asked if he could get a brace or boot and Dr. Su said it is more expensive but he could then walk and possibly bike. Somehow Andrew's former companion Elder Aiono received this today and forwarded it to Andrew's dad. These men love this family so much and you can tell from looking at the picture. So the rain kind of paused there for a little bit and we got to see the sun for a couple days here in Zhubei. So everyone's been outside enjoying the beautiful weather, and its made for some pretty great proselyting. And we actually found a guy that we've ran into a few times.And it turns out he actually got all the missionary lessons like 20 years ago! And didn't get baptized just because his family is Buddhist. But now that's not a problem and he's going to start meeting with us! Aren't miracles just the coolest? But anyways, our favorite family (the Liao Family) has their baptismal date this Thursday! I am so excited for them to take this huge step towards becoming an eternal family. Yesterday we reviewed the baptismal interview questions with them and I had the opportunity to see Angela (9 year old daughter) teach her father the 5 principles of the Gospel of Jesus Christ.. They are truly an amazing family. So yeah it's been a beautiful week in Zhubei. 蔡會長： "雨很大嗎?" *Looks out the window* "Ohhhhh"
So this was been a wonderfully cold and rainy week here in Zhubei. And the Taiwanese people, much like myself, don't like the cold. So you can say it's been quite difficult finding more prepared on the streets. But they are still out there! And within the past week we have actually found 2 people who have been on tours of the Salt Lake City temple and actually have interest in hearing more about why we have them! So yeah miracles are real, like for real. So this week we started out the week with a goal to find more new investigators, because we found our self with only 4 people to teach, and they all happen to be in the Liao family. And they're super super great and all but we need more people to teach lol. So we had a goal of 4 new investigators. And lately we've felt impressed to go knock some doors in the smaller villages near the mountains of our area. So when we did this the other night we got invited in to share our message by two different families in the same night! And both set up times for us to come back and share more this week. So yeah we've really been blessed as we set goals, share these goals with God through prayer, and go out and act on the inspiration! Week 20 Can I just say I LOVE ZHEBEI! So yeah another week in paradise. Can I just say I LOVE ZHUBEI. So its Chinese New Year here in Taiwan and like every other Chinese place, and its so much fun. The whole island kinda like shuts down. All the stores close and everyone just stays inside with their families. So on Friday we took a train over to Taipei for a mission conference and the Taipei main station was like empty at 7:30am which is usually the busiest time of the day. And when we got on the MRT (subway) there was actually room for everyone to sit down. It was crazy. But yeah probably the best part of Chinese New Year is that we get fed by the members everyday for lunch and dinner. There's so much food! Its a super great time to just sit down and talk with members about their efforts in sharing the gospel. And the members have been really good about inviting less active and non members. So yeah so many opportunities to spark or respark the light of Christ in peoples lives during this super happy time of the year. And yeah there's just SO MUCH FOOD.